The coaching staff reached out to multiple 2016 recruits this past week. Who did they contact? Which two prospects received scholarship offers this week? Which 2015 commit tweeted that they'd like to take two visits? Which recruits with interest from Michigan and Notre Dame will be in South Bend this weekend? Find out in this Friday's version of "The Future Huddle"
You may have noticed in the past week that there seems to be a lot of photo-shopped pictures being sent to recruits from the coaching staff. Well, on Monday at noon, coaches were officially allowed to contact 2016 prospects via social media. In my opinion, the coaching staff knocked the ball out of the park with the photographs, especially with Levonta Taylor's, and Janarius Robinson's. Although sending a picture won't win over a recruit, it definitely let's the recruit know their wanted. 2016 DE Rahshaun Smith received a scholarship offer on Monday morning. Rahshaun is a very intriguing prospect. Watching his highlight film, it’s easy to see that Rahshaun is one of the best players on the field at any given moment. He’s extremely strong for his age, and possesses a very quick burst off the line of scrimmage. Smith, who also saw playing time as an Outside Linebacker in his sophomore year, is a tackling machine. There is no better way to put it then; if he gets his hands on you, your going down to the turf. At 6’3 225 lbs, he fits the exact mold of what the Michigan coaching staff looks for in defensive ends. Our friend Garrett Fishaw, over at MGoFish.com caught up with Rahshaun earlier this week to talk about his scholarship offer, telling Garret that he is “very excited” about the offer. Rahshaun is currently ranked as the #15 overall prospect in 2016, and the #1 WDE according to Rivals. 2016 ATH Demetris Robertson was offered a scholarship on Wednesday afternoon. Robertson, who is currently committed to the Crimson Tide, is ranked as the #1 ATH, and #5 overall prospect in 2016 according to Rivals. Robertson boasts a very impressive scholarship offer list from many of the top schools in the nation including; Auburn, Georgia, Florida, LSU, Notre Dame, Ohio State, and Texas A&M. I believe Michigan faces an uphill battle in Robertson’s recruitment and, all signs point to him staying committed to Alabama for the long haul. Robertson also received offers from North Carolina and Miami on Thursday. Shortly after Michigan had put the finishing touches on Appalachian State, 2015 TE commit Chris Clark took to twitter to announce he would like to take two visits. Where would these two visits would take place? I would have to make the guess North Carolina, and perhaps Alabama. Although nothing is concrete right now, Clark is still a member of the 2015 recruiting class and will be until further noted. Sam Webb from Scout.com and, WTKA The Michigan Insider talked about Chris’s decision to tweet about the visits (which have since been deleted), and it seems that Chris was unaware of the no-visit policy that the Michigan coaching staff has in place. After Chris and Sam exchanged a few text messages with each other, it seems that Chris is unsure if he will end up taking those two visits. Hopefully after a conversation with Tight Ends coach Dan Ferrigno on Tuesday night, Clark will have a change of heart about the visits. As of right now, I think Chris will still remain a Wolverine come National Signing Day. The 2016 recruiting cycle features many high quality running backs such as; Miles Sanders, Antonio Williams, Kentrail Moran, and Elijah Holyfield. 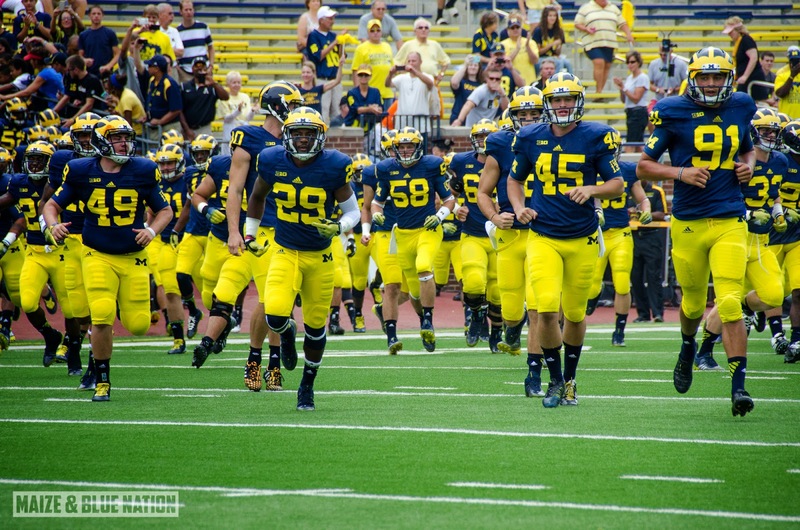 The one running back that sticks out the most to me is Kareem Walker. Although 2016 National Signing Day is light years away at this point, look for Michigan to be a major factor in his recruitment. Kareem’s next visit will be to Piscataway on September 13th, when Rutgers takes on Penn State. 2015 CB Iman Marshall has accepted an offer to play in the Under Armour All American game this upcoming January. 2015 K commit Andrew David continues to impress with his kicking ability. Andrew David tops last weeks 49 yard FG by drilling one from 50. Massillon still down 14-10. 2015 DE Target Keisean Lucier-South tweeted out earlier this week that he received a phone call from the coaching staff. Keisean is arguably Michigan’s top remaining target left on the recruiting board. KLS will be heading to Ann Arbor for an official visit when the Wolverines take on Penn State in October. Former commit George Campbell committed to Florida State on Friday afternoon. Michigan was left off his Top 5 list earlier in the year.